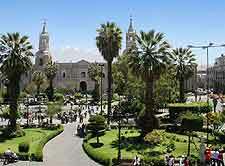 Shaped by a series of strong earthquakes and dramatic volcanic eruptions, the modern-day Arequipa is the second-largest of Peru's cities, after Lima. Arequipa is often referred to as the 'Ciudad Blanca' (White City), due to its assortment of colonial buildings constructed using the locally quarried off-white 'sillar' volcanic rock, and boasts exceptional sunny weather. The stonework of Arequipa is very distinctive in its appearance and many of the finest structures grace the majestic Plaza de Armas, along with plentiful tourist information, while elsewhere in this captivating Peruvian city are grand monasteries, historic churches and elegant mansions. Local Arequipenos (residents of Arequipa) are fond of spicy food and this modern city certainly comes alive at night, when the bars and restaurants quickly start to fill up. Arequipa provides great tourism appeal and serves as a good spot to rest in southern Peru, before venturing to Cusco, Machu Picchu and Lake Titicaca, where the higher elevations will require a period of acclimatization. The old city centre now ranks as a UNESCO World Heritage Site and is steeped in history, and many a tourist finds the challenge of climbing the adjacent cone-shaped guardian volcano of El Misti too hard to resist. 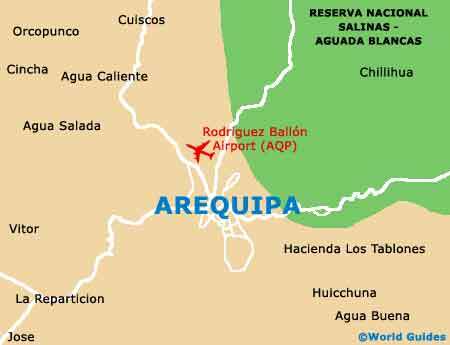 Worth noting, Arequipa lies within the Andes mountains, and so the high altitude may take a while to get used to. Guided bus tours are always a good way to get your bearings of Arequipa and not only do they tour the city and its neighbouring valleys, but stop off along the way, at various attractions. Tourists who prefer to do their own thing will find that there is much to see around Arequipa, with highlights including the Sabandia Mill (Molino de Sabandia), the stone hill known as the 'Sachaca', and the north-easterly suburb of Yanahuara, where Spanish-colonial architecture abounds. Those feeling more adventurous will be able to enjoy everything from trekking and horse riding through the canyons, to mountain biking around Chachani and the Laguna de Salinas (salt plains), and white-water rafting outside of the rainy season, on the Chili, Colca, Cotahuasi and Majes rivers. 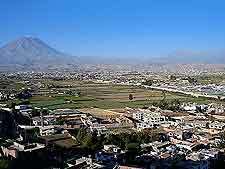 More information about Arequipa Tourist Attractions. 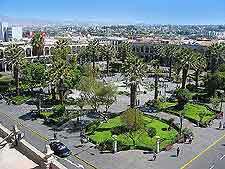 The history of Arequipa is very much evident in its fine buildings and landmarks, with its historical centre forming an area surrounding the Plaza de Armas and is filled with sights. Particularly prominent is the cathedral, which dates from the 17th century, although has suffered much earthquake damage over the years. Nearby, the Iglesia de la Compania is another especially beautiful church and stands on the Calle Alvarez Thomas. However, it is Arequipa's much-loved Monastery of St. Catherine (Convento de Santa Catalina) that draws the largest crowds and is a vast religious complex, surrounded by imposing walls. 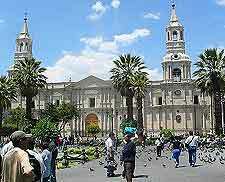 More information about Arequipa Landmarks and Monuments. Several museums are located within the city of Arequipa and offer information on various different topics, relating to the Andes mountains, regional history and archaeology. In particular, the Museo Santury and its many well-preserved mummies and gold treasures is always popular. There are also some very notable art galleries to be found in Arequipa, namely the Museo de Arte Contemporaneo (Contemporary Art Museum) and the Galeria de Exhibiciones del Banco Continental, the latter of which is housed within the grand Triste del Pozo manor. 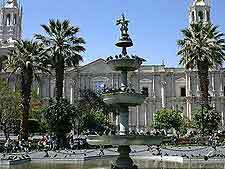 More information about Arequipa Museums and Arequipa Art Galleries. Surrounding Arequipa, the Canyon County offers endless day trip possibilities and tourists always enjoy exploring the Majes Canyon in particular, as well as the petroglyphs of Toro Muerto. Also nearby is the famed Valley of the Volcanoes (El Valle de los Volcanes), next to the foot of the Nevado Coropuna mountain. A little further away from Arequipa but still very much within reach is Lake Titicaca and its adjacent cities of Juliaca and Puno, while nearer to home, the Salt Lake (Laguna de Salinas) offers many outdoor activities and when full, is always brimming with Andean waterfowl. For more Peruvian wildlife, check out the Salinas and Aguada Blanca National Reserve (Reserva Nacional Salinas y Aguada Blanca), within the Moquegua region. 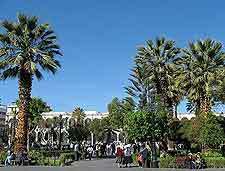 More information about Arequipa Attractions Nearby.